Executive Hair Designer, Félor Davachi, is proud to announce the highly-anticipated launch of her salon in Yorkville! An industry icon, over the last thirty years, Félor has designed the hairstyles of major celebrities and high society, all over the world. Consistently trusting instinct, Félor’s philosophy on life is not much different from her practice; boisterous, lively, overflowing beauty. Injecting her remarkably infectious and sultry energy in every session, Félor insists on affecting an imaginative dialogue of beauty and fantasy with clientele. Beginning her mastery in Tehran, Félor curated numerous era-defining looks of renowned film and television stars, at the peak of the post-revolutionary Persian Cinema culture. Riding the wave of her success back home, Félor left for Stockholm in 1984, delving into the upper society circles and bringing her signature brand of intuitive and effortless hair designs to the Swedish upper society. In 1985, after a year of European industry acclaim, and in favourable circumstances, Félor was given an opportunity to relocate her work to Toronto. Grounding herself in North America for the last three decades, it is in Canada where Félor rose to acclaim. Establishing herself as a master stylist in Salon Daniel and Salon Fiorio, Félor later found further acclaim during her highly memorable years at Femme Coiffure, as a Executive Hair Designer, conceiving looks for top tier clientele, and additionally, branding herself as a consistent name during the Toronto International Film Festival and seasonal Fashion Week’s. In early 2015, Félor followed a determined instinct to embark on a journey in establishing her own salon, in her beloved neighbourhood of Yorkville. It is at 97 Scollard Street that Félor founded ‘Salon Davachi’, with Emily Garabachi. The salon, an exquisite 2000 sq ft. space, comprehensively embodies the aesthetics of Félor and her relentless finesse. Alongside hair services, the salon offers extensive aesthetic beauty services, from Facials, waxing, Microblading to a comprehensive Lash Lounge + Brow Bar and much more. This salon is driven by love, passion, and most importantly, family. As an industry veteran, Emily Garabachi has spent numerous years working her way up from Yorkville’s luxury fashion to skin care and beauty industries. 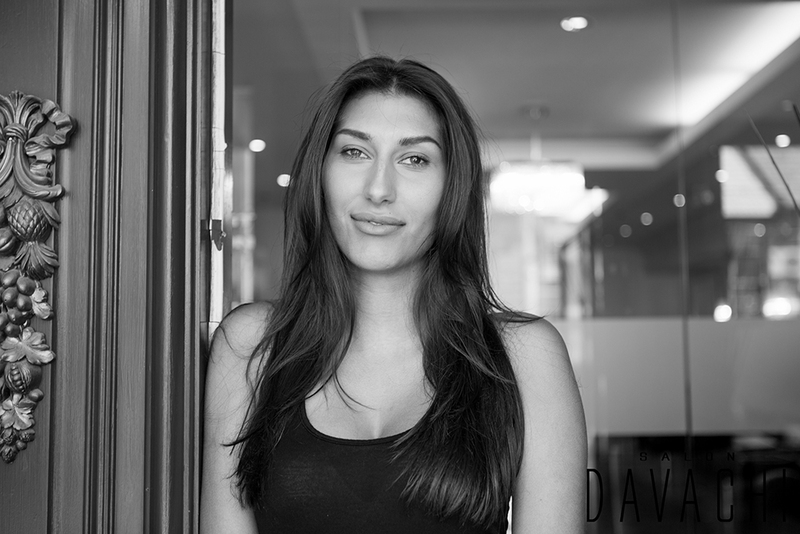 As the Director of Operations at Salon Davachi, Emily’s role is vital to the overall success and operations of the salon. Joining executive hair designer, Félor Davachi, on this highly anticipate endeavour, Emily oversees the salon from every managerial aspect and plays multiple roles. Emily, alongside our PR representation, are responsible for countless, brilliant press and media campaigns and coverage for the salon, from our fabulous grand opening event, and beyond. Emily manages the front of house and parallel to the operations of the salon, also, completely oversees the relationship between the salon and our exclusive luxury line of Oribe products. Emily established this relationship in early 2015, securing Oribe as the official product line at the salon, one of the only salon’s in Toronto to carry the complete line. In 2015, simultaneously to her role as DOP at Salon Davachi, she received her specialized certification in Lash & Brow Extension services. She further continued her efforts, training at Winks Boutique in Yorkville. Emily specializes in eyelash extensions, eyebrow extensions, eyelash perming, brow and lash tinting and much more! In addition, she received her certification from Global Best Beauty, specializing in Hair Extensions. She has gone through full training to learn multiple methods of hair extension applications including new seamless tape extensions which is newest form of hair extensions in the market right now! Emily gets her drive for this industry, through her socialite friends and acquaintances who represent her work, every day, in the fashion, nightlife, and event industries! Emily believes beauty is for all, and she lives a life to implement this belief!